A popular recreation destination year round, Lake Billy Chinook is a large reservoir north of Bend, surrounded by Central Oregon’s scenic high desert countryside. Full service resort 45 minutes North of Bend on Lake Billy Chinook. Rent houseboats with hot tubs, ski boat, fishing boats, pontoon boats, wave runners, kayaks & pedal boats. Lake Billy Chinook camping can be enjoyed year round. 4,000 acres of water in central Oregon’s sunny high desert. Kokanee salmon and trophy size bull trout attract anglers to the reservoir. Just 44 miles north of Bend via Hwy 97. Less than an hour north of Bend is Lake Billy Chinook, this scenic lake was created when the Round Butte Dam was built on the Deschutes River in 1964. The 4,000 acre reservoir is lined with steep basalt cliffs and surrounded by a high desert landscape dotted with sagebrush and juniper. With over 300 days of sunshine each year, Lake Billy Chinook and beautiful Cove Palisades State Park make this area a popular recreation destination. Visitors can enjoy a variety of outdoor activities including fishing, hiking, waterskiing, picnicking and camping. Lake Billy Chinook Oregon is about 44 miles due north of Bend, via Hwy 97. Oregon Parks and Recreation Department, 725 Summer St. NE, Ste C, Salem, OR 97301. Phone: 503-986-0707. Cove Palisades State Park – Open year round, part of the reservoir is located within this park. Covering 4,403 acres, Cove Palisades offers 10 miles of hiking trails, boating facilities, and a marina. Lake Billy Chinook campgrounds at the park include 265 campsites, of which 174 are for RVs. Fishing – Avid anglers are drawn to Lake Billy Chinook. Fishing is excellent here for a variety of fish including rainbow trout, Kokanee salmon, bass, and record-size bull trout. 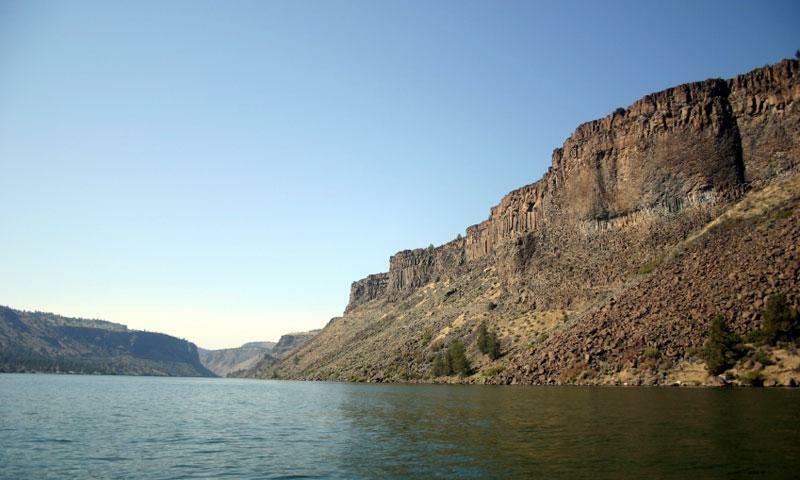 Water Sports – Lake Billy Chinook is a popular summer destination for swimming, boating, and waterskiing. The reservoir is the fullest from June 15 through September 15. Lake Billy Chinook and Lake Simtustus are separated by the Round Butte Dam. The Island in Lake Billy Chinook was created from a lava flow. It provides a valuable habitat for eagles and other types of raptors. It was closed to recreation in 1997 and is used only for education and research. The Confederated Tribes of Warm Springs and Portland General Electric jointly own the reservoir and dam. The reservoir has a maximum depth of 400 feet.